Mark Bollobas We're off on a roadtrip, of sorts! Three of us from SBrick are heading to Copenhagen for the LEGO World exhibition. Will you be there? Then we should meet up! We're available on February 14 AND 15, so let's make some plans now! We'll be updating our... moreWe're off on a roadtrip, of sorts! Three of us from SBrick are heading to Copenhagen for the LEGO World exhibition. Will you be there? 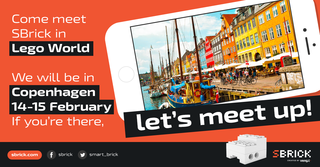 We'll be updating our location here on Facebook and also through Twitter, but if you're already going to Denmark in two weeks, then let's schedule a get-together! We're off on a roadtrip, of sorts! Three of us from SBrick are heading to Copenhagen for the LEGO World exhibition. Will you be there?